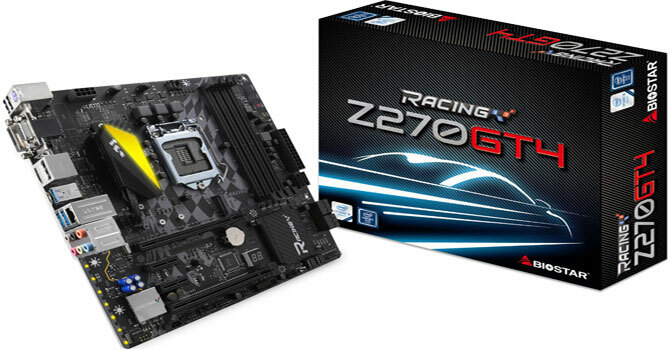 It wasn't until this mATX board, the Biostar Racing Z270GT4, showed up that I realized I have not had the chance to play with a mATX motherboard in a long time. A real long time. It seems most users favor either mITX or full ATX products, but the mATX form factor allows manufacturers to give us full-size ATX CPU power regulation, 4 DIMM slots, and just a few expansion slots, making for a smaller PC for those users who only use a single VGA, but who might also like to use another PCIe device, such as a sound card or a RAID controller. When I was thinking about who might actually benefit from the use of mATX boards, and why they had kind of dropped from my mind completely for maybe a year or two, I recalled that I myself used many mATX boards before getting into high-performance PCs. Simply put, they were more affordable. They also allow you to build a slightly smaller PC, although these days, mITX and others do smaller PCs better, I think. 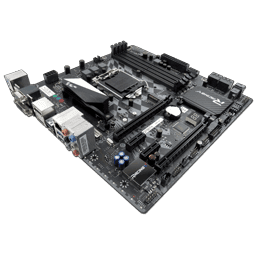 Enter the Biostar Z270GT4. Biostar is the epitome of decent entry-level affordability. The Biostar Racing Z270GT4 is not. We've got lights, dual BIOS, touch-pad buttons? An LN2 switch!?! While all that may seem like normal stuff for a high-end product, this here Biostar Racing Z270GT4 stays true to Biostar's mainstream focus of providing affordable parts; the Biostar Racing Z270GT4 costs just a bit over US$100! mATX form factor; 9.6" x 9.6"